Computational thinking is loosely defined as the habits of mind developed from designing programs, software packages, and computations performed by machines. Dies meint die Fähigkeit, Probleme und Prozesse so zu formulieren, dass sie sich mithilfe von Computertechnologien lösen bzw. Bearbeiten lassen. Dies umfasst einerseits die Auswahl und Nutzung und andererseits auch die Programmierung geeigneter Software. Computational thinking is thinking in terms of prevention, protection, and recovery from worst-case scenarios through redundancy, damage containment, and error correction. It is calling gridlock deadlock and contracts interfaces. It is learning to avoid race conditions when synchronizing meetings with one another. we have created the following working definition of CT: The conceptual foundation required to solve problems effectively and efficiently (i.e., algorithmically, with or without the assistance of computers) with solutions that are reusable in different contexts. This definition highlights that CT is primarily a way of thinking and acting, which can be exhibited through the use particular skills, which then can become the basis for performance-based assessments of CT skills. Computational thinking is thinking recursively. It is parallel processing. It is interpreting code as data and data as code. It is type checking as the generalization of dimensional analysis. It is recognizing both the virtues and the dangers of aliasing, or giving someone or something more than one name. It is recognizing both the cost and power of indirect addressing and procedure call. It is judging a program not just for correctness and efficiency but for aesthetics, and a system’s design for simplicity and elegance. it means understanding the consequences of scale, not only for reasons of efficiency but also for economic and social reasons. Computational thinking is using abstraction and decomposition when attacking a large complex task or designing a large complex system. It is separation of concerns. It is choosing an appropriate representation for a problem or modeling the relevant aspects of a problem to make it tractable. It is using invariants to describe a system’s behavior succinctly and declaratively. It is having the confidence we can safely use, modify, and influence a large complex system without understanding its every detail. It is modularizing something in anticipation of multiple users or prefetching and caching in anticipation of future use. Papert and Harel (1991) were the first who coined the term “computational thinking” in their 1991 paper on constructionism. They proposed that computational thinking was a shift on students’ thinking by contributing to their mental growth and become producers of knowledge using computing. Computational thinking received broader recognition from Wing (2006) who suggested that computational thinking was a critical twenty-first-century skill comparable to reading or math. Wing described computational thinking as “the thought processes involved in formulating a problem and expressing its solution in a way that a computer—human or machine—can effectively carry out” (p. 33). Ever since Jeannette Wing (2006) coined the term “computational thinking,” there has been a debate over providing a single definition. Despite the lack of a consistent definition, within the Computer Science community, a common understanding of the term emerged related to abstraction as a means for solving problems. According to P.J. Denning (2009), computational thinking is just a new term for a core concept, algorithmic thinking. Computer Science is not just about programming, but an entire way of thinking. The Computer Science community believes that learning to think in this way, to think computationally, could promote new perspectives and solutions to problems in many other disciplines (Wenger, 1998). Computational Thinking (vgl. GAS 2014) betont den Stellenwert des Nachdenkens und Analysierens von Problemen und Problemlösungsstrategien, die der anschließenden Umsetzung mit ei nem Computer vorausgehen. Hierzu gehören die Anwendung verschiedener In der Informatik zentraler Konzepte wie Logik (analysieren und Voraussagen treffen), Abstraktion (Unwichtiges weglassen), Dekomposition (Komplexität in Teilprobleme zergliedern) und Algorithmisieren (Prozesse automatisieren und nachvollziehen) sowie Arbeitsweisen, die in der Informatik und bei der Nutzung und Gestaltung digitaler Medien gefördert werden. Hierzu zählen Kreativität (Gestalten und Umsetzen von Ideen), Debuggen (Fehler finden und korrigieren). Durchhalten (Probleme meistern lernen) und Kollaboration (zusammenarbeiten). Wing’s original paper did not offer a succinct definition for computational thinking, but offered many examples of how computer scientists tackle common problems: “When your daughter goes to school in the morning, she puts in her backpack the things she needs for the day; that’s prefetching and caching. When your son loses his mittens, you suggest he retrace his steps; that’s back-tracking. [...] Which line do you stand in at the supermarket? ; that’s performance modeling for multi-server systems.” . Extrapolating from these examples, the overall message is that computer scientists have a toolbox of methods for matching problem situations to standard types of solution, drawn from various parts of the computer science curriculum, and, perhaps just as importantly, a standard terminology to describe these abstract problemsolution patterns. Endlich wird in vielen Fächern durch das Lösen von Problemen ("problem solving approach") das informatische Denken gefördert. CT is not about getting humans to think like computers, but rather about developing the full set of mental tools necessary to effectively use computing to solve complex human problems . Ubiquitous computing is to today as computational thinking is to tomorrow. Ubiquitous computing was yesterday’s dream that became today’s reality; computational thinking is tomorrow’s reality. Just as the printing press facilitated the spread of the three Rs, what is appropriately incestuous about this vision is that computing and computers facilitate the spread of computational thinking. Computational thinking is a fundamental skill for everyone, not just for computer scientists. To reading, writing, and arithmetic, we should add computational thinking to every child’s analytical ability. Computational Thinking ist ein Ansatz, der bewusst auf Konzepte und Problemlösungsstrategien allgemeiner Relevanz fokussiert. Es geht unter anderem darum, den Zusammenhang zwischen sequenziellen und parallelen Prozessen zu verstehen. Computational thinking involves solving problems, designing systems, and understanding human behavior, by drawing on the concepts fundamental to computer science. Computational thinking includes a range of mental tools that reflect the breadth of the field of computer science. Computational thinking confronts the riddle of machine intelligence: What can humans do better than computers? and What can computers do better than humans? Most fundamentally it addresses the question: What is computable? Today, we know only parts of the answers to such questions. Computational thinking will have become ingrained in everyone’s lives when words like algorithm and precondition are part of everyone’s vocabulary vocabulary; when nondeterminism and garbage collection take on the meanings used by computer scientists; and when trees are drawn upside down. 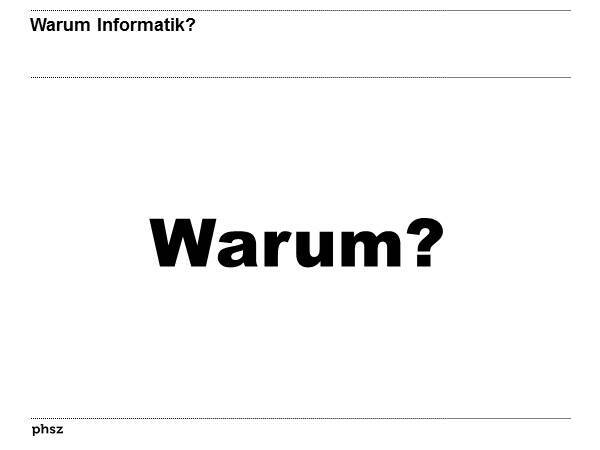 Dieses Computerdenken kann man lernen, ohne den konkreten Programmcode zu kennen, sagt auch Ulrich Kortenkamp, der an der Universität Potsdam Didaktik der Informatik lehrt. Er ergänzt aber, dass es viel einfacher und schöner sei, wenn man auch programmieren darf. "Das ist die naheliegende praktische Umsetzung, die man sich nicht nehmen lassen sollte." Computational Thinking ist ein Denken mit und in numerischen Modellen. Im Altertum wurden Theorien aufgestellt – Astronomie mit Kugeln auf Kreisen –, in der frühen Neuzeit wurde gemessen und experimentiert – Kugeln auf Ellipsen, Bahnen mit Abweichungen –, und heute wird zusätzlich numerisch modelliert. Ohne Computer wäre schon der Mondflug unmöglich gewesen. True, an algorithm is a series of steps—but the steps are not arbitrary, they must control some computational model. A step that requires human judgment has never been considered to be an algorithmic step. Let us correct our computational thinking guidelines to accurately reflect the definition of an algorithm. Otherwise, we will mis-educate our children on this most basic idea. Computational thinking provides an ontology of computational concepts, and a set of terms for talking about them. For example, procedural and data abstractions provide the building blocks of computational solutions, and sequential and parallel composition provide a way of putting them together. Hierarchical decomposition is used to reduce complex problems, and encapsulation is used to create re-usable solutions. If computational thinking is the central tool of computer scientists, then we ought to consider whether computational thinking becomes just another instance of Maslow’s Hammer : “If all you have is a hammer, then everything looks like a nail”. In other words, computer professionals may attempt to solve all problems through algorithmic means, while failing to perceive those that cannot be expressed using the abstractions of CT.
Because computation has invaded so many fields, and because people who do computational design in those fields have made many new discoveries, some have hypothesized that CT is the most fundamental kind of thinking, trumping all the others such as systems thinking, design thinking, logical thinking, scientific thinking, etc. This is computational chauvinism. There is no basis to claim that CT is more fundamental than other kinds of thinking. Computational thinking is using heuristic reasoning to discover a solution. It is planning, learning, and scheduling in the presence of uncertainty. It is search, search, and more search, resulting in a list of Web pages, a strategy for winning a game, or a counterexample. Computational thinking is using massive amounts of data to speed up computation. It is making trade-offs between time and space and between processing power and storage capacity. Finally, it is worth noting that educators have long promoted a large number of different kinds of thinking: engineering thinking, science thinking, economics thinking, systems thinking, logical thinking, rational thinking, network thinking, ethical thinking, design thinking, critical thinking, and more. Each academic field claims its own way of thinking. What makes computational thinking better than the multitude of other kinds of thinking? I do not have an answer. Encouraged by funding programs from the NSF, the US computer science community has readily adopted the term computational thinking, using it as a slogan to re-design existing computer science curricula to make them more attractive to students, and to develop new courses aimed at audiences who would not otherwise be exposed to computer science. For example, the Computer Science Teachers Association (CSTA) set up a task force to “explore and disseminate teaching and learning resources related to computational thinking”. Computational thinking (CT) stems back to the constructionist work of Seymour Papert (Papert, 1980, 1991) and was first coined as a term in a seminal article by Wing (2006). She explained that CT entails “solving problems, designing systems, and understanding human behavior, by drawing on the concepts fundamental to computer science” (Wing, 2006, p. 33). As such, it represents an ability to analyze and then solve various problems. Her arguments provided a fresh perspective on the relationship( s) between humans and computers, and gave rise to a wave of research on CT. The computational thinker looks for problems that can be tackled with computers. Immediately, this provides a selective lens through which to view the world. Problems that are unlikely to have computational solutions (e.g. ethical dilemmas, value judgements, societal change, etc) are ignored. Others are reduced to a simpler, computational proxy. It is no coincidence that computer science students tend to be less morally mature than students from other disciplines . Ethical dilemmas have no computational solutions, and so are overlooked when peering through a CT lens. Computational thinking (CT) is an old idea in CS, first discussed by pioneers such as Alan Perlis in the late 1950s.8 Perlis thought “algorithmizing” would become part of every field as computing moved in to automate processes. Dijkstra recognized he had learned new mental skills while programming (1974). In his 1980 book Mindstorms, Papert was the first to mention the term CT explicitly when discussing the mental skills children developed while programming in Logo. Jeannette Wing catalyzed a discussion about how people outside CS could benefit from learning computing. At heart, CT is inherently reductionist. Computational problems are tackled by reducing them to a set of discrete variables that can be mapped onto abstract data types, and a set of algorithmic steps for manipulating these data types. In the process, multiple perspectives on the nature of the problem are lost, as is any local, contingent knowledge about the problem situation . Computational thinking thus ignores the fact that any particular expression of the “the problem to be solved” is the result of an ongoing negotiation between the competing needs of a variety of stakeholders , . Problem reformulation - Reframe a problem into a solvable and familiar one. Recursion - Construct a system incrementally based on preceding information. Problem decomposition - Break the problem down into manageable units. Abstraction - Model the core aspects of complex problems or systems. Systematic testing - Take purposeful actions to derive solutions. Although there are different efforts to define the term and there is no consensus on different definitions, there is a general acceptance that CT skills cover the concepts of “abstraction, algorithmic thinking, problem-solving, decomposition, generalization, and debugging” (Sarıtepeci & Durak, 2017). In support of this, Kalelioglu, Gülbahar and Kukul (2016) have formed a word cloud in relation to the explanations about computational thinking in their work and have found that the data words that are most used in terms of defining the process of computation thinking in the literature are “abstraction, problem, solving, algorithmic and thinking. 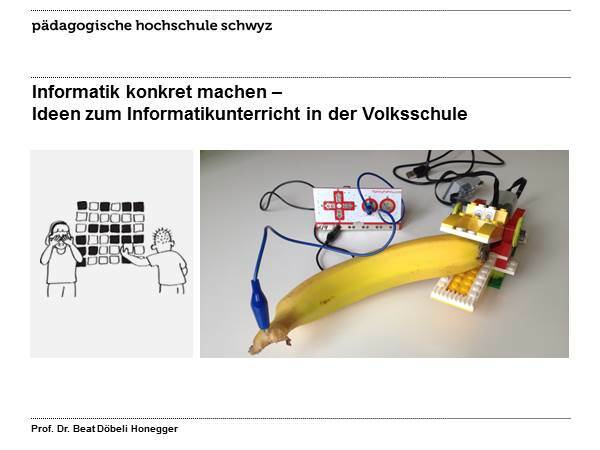 Wer hätte sich nicht schon präziser Überlegungen zum Thema "computational thinking" gemacht! Eine fundierte Betrachtung erscheint notwendig. Ein erstes Mal aufgegriffen wurde das Thema vor 41 Jahren. Damals war vieles noch anders. Oft wird Alexander Repenning zum Begriff computational thinking zitiert. Doch auch Ashok R. Basawapatna hat diesbezüglich einen guten Ruf.